What sets Nahe apart from other regions is its geological diversity. There are 180 different soil types within the 4,000-hectare region. This wealth of soil types includes quartzite and slate in the lower valley near the Rhine, porphyry, melaphyre and colored sandstone in the central valley and weathered soils and layers of clay with sandstone, loess and loam in the higher valley. The riesling grape adapts well to the various soil types, and the wines produced in Nahe range from outstanding dry wines to sweet wines. But in making dry riesling, the diversity of the region is exposed. 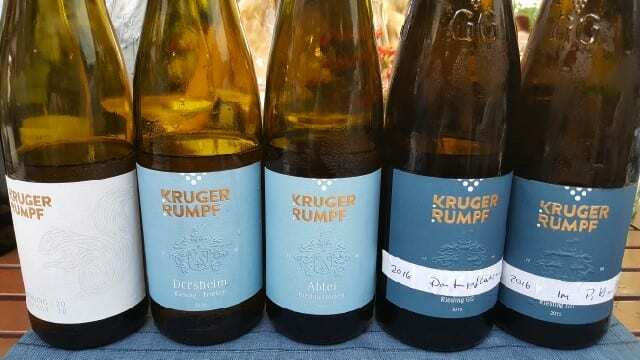 We met Georg Rumpf in the garden of his mother’s restaurant, as the family has both a winery and a restaurant. The Rumpf winery has a 300-year tradition, and the Kruger family, through marriage, became a part of it 50-years ago. Georg was studying to be a dentist but after an injury sidelined his father, he came home to help. 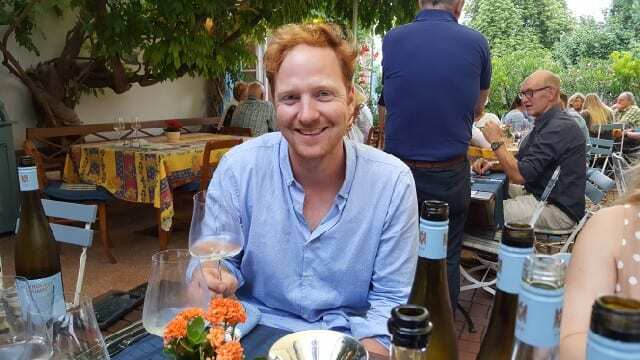 By the time his father returned to work, Georg had shifted gears and returned to school to study viticulture and beverage technology. The 2016 Dorsheim Riesling Trocken is a village cuvee and a mix of volcanic, quartz, pebbles and steep vineyards. The wine has a fresh style with aromas of white flowers and stone fruit and great acidity. The 2016 Abtei Riesling Trocken comes from the most northern region in Nahe, closest to river Rhine. It faces south with rocks and slate resulting in a wine of pineapple, citrus, smoke and stoniness, full mouth acidity and well-balanced. The 2016 Dautenpflänzer Riesling GG comes from the warmest and driest spot with loos and loam soils and quartz below, resulting in a wine with tropical fruit notes compared to the 2016 Im Pitterberg Riesling GG, which comes from slate and has notes of young pineapple and great texture on the palate. The Tesch family has had the winery since 1723. But despite the history, it was not Martin Tesch’s dream. Leaving home at the age of 15, Martin trained as a microbiologist and microchemist and returned to the family winery in his 20s at the end of the 1990s. At the time, the winery had 12 different grapes, offering a broad selection for to please everyone. But today, Tesch, with 90 percent riesling production, is very focused with only six wines focusing on the diverse terroir of the region. As Martin explained, wines are “the structure of the landscape. We start in the vineyard to understand the wines.” Tesch does not use pesticides, herbicides or agrochemicals, and focuses on biodiversity in the vineyard to achieve a balanced environment. While Tesch is not part of the VDP system, the wines are all dry. Each wine, labeled by a different color, is a vineyard designate that showcases the diverse terroir. The Riesling Unplugged 2015 Trocken is a wine that expresses that Tesch does things with limited technology. They do not acidify, de-acidify, add sugar or use funky yeasts, and the result is a wine with a bright nose of white peach, stone fruit and minerals and medium acidity. The Tesch Riesling 2015 Lohreh Berg comes from loamy, gravel laden soil which results in a wine with floral, tropical, apple notes and lively minerality. 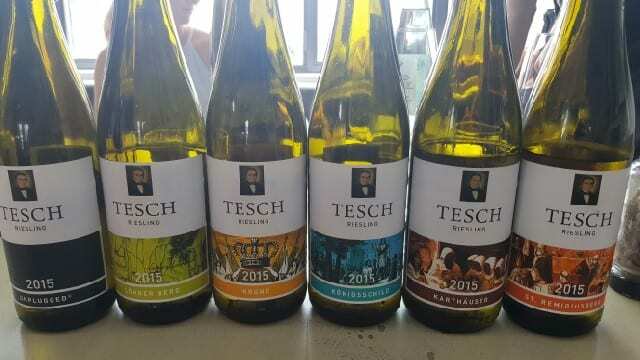 The Tesch Riesling 2015 Krone (crown) comes from light and coarse soils and is less aromatic with banana leaf, green papaya, floral notes and linear, soft acidity on the palate. 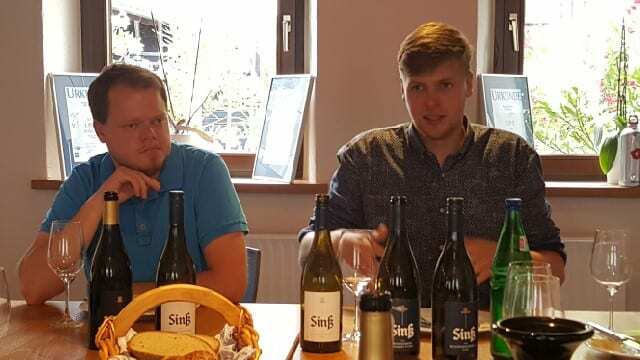 The Tesch Konigsshild 2015 comes from calcareous limestone with loess and river loam resulting in a wine with an aromatic wine of pineapple, floral, lime notes whereas the Tesch Karthauser 2015 comes from weathered sandstone and has leaner minerality and tangerine notes. The Tesch St. Remigiusberg 2015 comes from volcanic rock and iron-rich clay, resulting in a wine with tropical fruit, apricot and richness in the nose that is cut by linear, lime grapefruit acidity and minerality on the palate. Originally built in 1791, the property was a house, vineyards, fields and animals. 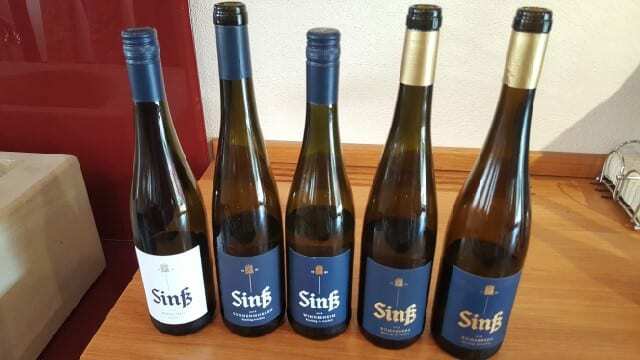 Converted to wine in the 1970s, Sinss is a family business that has been passed down through the generations. Currently, brother Johannes and Marcos run the winery. Johannes started in 2010 after studying wine, and his brother, Marcos, joined in 2016 after working in renewable energy. The 2016 Riesling Trocken comes from slate and gravel, and the wine has a long mouthwatering finish. The 2016 Windesheim Riesling S comes from three vineyards that blend red sandstone, slate and chalk for a wine with apricot and lemon pith notes. The 2015 Römerberg Riesling R, which is grown in red sandstone, has a lean nose and delicate acidity. 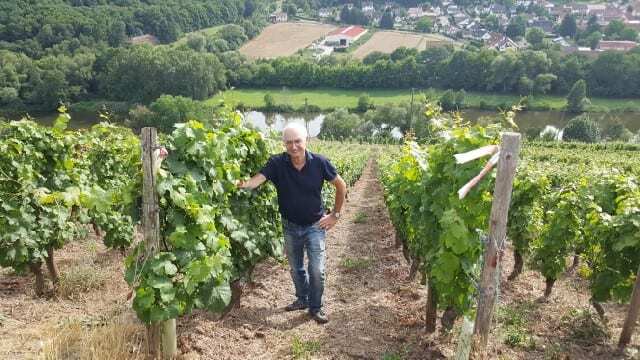 Donnhoff has 25 hectares of Erste Lage (grand cru) vineyards. Roxheimer Höllenpfad is a steep vineyard with a southern aspect and weathered red sand stone soil.The 2016 has delicate minerality, aromatic notes of white flowers, lemon and spice, soft acidity and elegant finish. Felsenberg is located on steep southern slopes with volcanic porphyry and melaphyr, and “Felsenturmchen” is in the heart of the vineyard. The 2016 Felsenberg “Felsenturmchen” GG is expressive with racy fruitiness and mineral acidity. Dellchen is a steep terraced vineyard with slate and porphyry soils and the 2016 Dellchen GG is powerful with mineral elegance, balanced acidity and aromas of jasmine and stone fruit. Hermannshöhle, with blackish-grey slate soil and volcanic elements, is one of the most famous vineyards in Nahe. The 2106 Hermannshohle GG has beautiful aromas of lemon and melon, whereas the 2104 Hermannshohle GG has developed notes of honey and petrol. 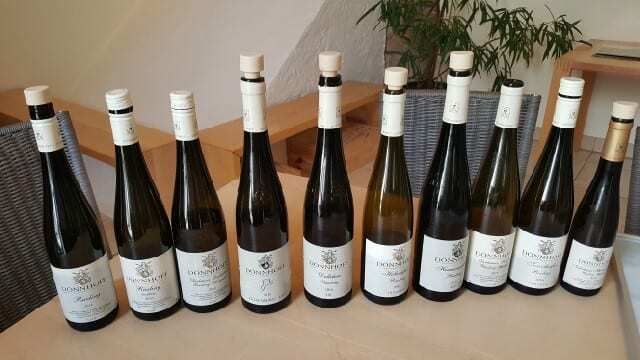 My visit to Nahe was brief, but my exposure to the diversity of dry rieslings was vast. Next time you think about drinking riesling, perhaps you will think about a dry one from Nahe. 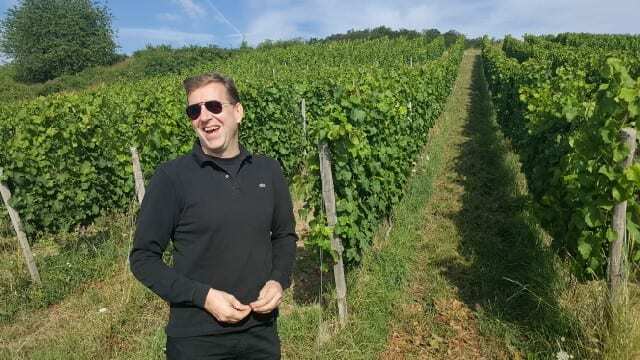 This entry was posted in Lifestyle, Travel, Wine and tagged Donnhoff, dry riesling, Georg Rumpf, German wine, Germany, Helmut Donnhoff, Kruger Rumpf, Martin Tesch, Nahe, Napa Valley Register, Riesling, Sinss, Tesch, white wine by Allison Levine.